CLICK HERE TO BUY YOUR BELLATOR 126 TICKETS!!!! Took some time off after a torn rotators cuff surgery, and I will tell you the time off was a blessing in disguise. I had been fighting top level dudes with injuries I thought were minor, and wow! You should see how strong I am now that I’m all healed up. Definitely, “A Blessing in Disguise.” Ready to take on all on-comers!!!! WAR STUNNA!!! — in New Orleans, LA. I go hunting once a year in AZ with my brother Ces and Dad. Check out our video. Ortiz’s Hunting from Unaffiliated on Vimeo. Something I like to do is always look sharp. Image is everything. When you look good, you feel good, and everything else falls into place. HAPPY NEW YEARS! Great things coming in 2013 for the Stunner! “Stunna” vs #10 rank welterwieght in the world Douglas Lima. That was a tough tough fight. Gave it all I had and Douglas deserved that win. I would take that fight again in a heartbeat and leave everything I have again. Next time at 170 lbs instead of catch weight 180 because I’m a small 180, but hell of a fight guys. I wish the ref let me ride out that last 10 seconds and give me the respect I earned, I wasn’t hurt by the kick, took way harder hits then that earlier, and that flying knee missed, but hats off to Lima. Hello fight fans! just finished up an exhausting day of cutting weight, press conferences, media interviews, and then weigh-ins. we have created a short clip today for you of myself in Canada before weigh-ins. Enjoy. Want to see your company or brand name on National Television? My fight will be aired live on MTV2 Nov. 2nd, 2012. Positions available for : Shorts, Fight Banner, Website, Shout outs, other media, and a willingness from me to get anything done you need included commercials. Hermosillo, Mexico walk-out song for Title Fight. I would like to fight immediately, once every weekend if I could. Currently I have a couple verbal offers for October and November, but I need something contracted immediately. Is there anyone you would like me to fight? Please contact my manager at the link on the bottom of the page. Mexico Fighter 4 – After my fight pics with Friends and Fans! I love my fans! These are my Mexican fight fans while i won the 170 lb Title Fight in Mexico. I was amazed how much love I was giving from the fans. Just check out all the pics to see what I mean. Come watch me fight for the Title this Saturday in Hermosillo, Senora, Mexico! I dropped a weight class and it should be a great fight and packed house. Cost is about $100 Pesos and $200 Pesos for ringside so that’s about $8 Dollars General Admission and $16 Ringside Floor seats. 170 lbs MEXICO FIGHTER TITLE FIGHT! Tomorrow night (June 2nd, 2012) Tim and I will throw down in the cage. Here is a picture from Weight-Ins. That makes 12 wins with 4 TKO/KO’s in a row. Still awaiting that call from the big guys. Bellator 55 – Ortiz vs Garcia 17,000 Youtube plays in only 1 week! Amazingly someone posted My Bellator 55 fight video on Youtube and dozens of MMA newspapers and Online media featured the fight as a “One Punch Knock Out” and the Youtube video had over 14,000 views in 2 days and over 17,000 in one week. The headliners at Bellator 7 didnt even come close that, it had about 6000 views. Well thanks to everybody who loves watching the crazy stuff that happens at MMA and I’m proud to have entertained you with my fights! Here are just a few of the online websites posting. Bellator 55 – After my fight pics with Friends and Fans! I love my fans! Its great I get an opportunity to meet so many people who believe in who I am. My favorite picture on this list is a young and sweet fan who is giving me a kiss on the cheek! Great pic! lol. VersaClimber.com – My Newest Sponsor! I actually have one of these Versa Climber exercise machines and I incorporate it into my strength and conditioning workouts and between training during rounds. Love it. Bellator 55 October 22nd, 2011 – HERE I COME! My next fight is on Bellator 55 fight card. Date is October 22nd, 2011. Fights are live in Yuma, AZ and will be televised on MTV2 and online at Spiketv.com. My opponent is 10-2 Edgar Garcia who has fought in WEC and UFC before. Lets see what this kid really has. He’s been beaten before, in my eyes I’ve never been beaten, never even been taken down. This is definitely a great fight for me, and the pay is not to shabby either. See you there. Great times with my Mexico Fight Fans! While during my last fight trip to Hermosillo, Mexico I met a couple cute girls who can totally rock out to any 80’s rock tracks you can think of. The crazy thing is they only spoke spanish, but sang every song we threw at them better then the original artist. By the way I won my fight, this was the after party. I beat Victor Ortiz by 1st round TKO in the Mexico Fighter promotion. Starting to feel better. Found this on the web this evening. On a trip out from AZ to Oklahoma to corner my partner Ryan Kelly with his pro fight I enjoyed some company backstage with Eddie Moneys daughter Jessie Money. She has a great voice as well. You may know Eddie Money from that 80’s hit “Take me home tonight!”. Jessie was awesome. Can’t wait to cross paths with her again. Enjoy. 2011 – Bringing in the new year! Ultimate Combat Experience, Vernal, Utah. September 18, 2010. The Stunna (9-2) Wins by TKO in UTAH! KOBE THE STUNNA (9-2) vs Mike Crisman (25-26) Fight. This was a tuff 3 round war which turned UTAH fight fans in attendance into Stunna Fans! Crisman was a big puncher and delivered powerfull low kicks but was no match for Kobe. Kobe full mounted Crisman and forced a TKO stoppage end of 3rd round when Crisman could no longer protect himself against a reign of strikes. Good fight for the Stunna! Cornerman Ces, Stunna, and cornerman Cabrera before fight. Thanks for coming to my page. Haven’t posted much since my fight in June, still waiting for that fight video to come in so I can post the highlights, but until then I’ll let you know whats been going down in my life. I have a couple fight possibilities coming real quick here in September on October. September I will be traveling to Utah to fight a real tough kid with alot of fights. After then I’m looking to head towards a fight in Nevada, and in November looking to fight in my Hometown. As we know, no fight is set in stone unless your locked in a contract with some of the upper leagues. Since my last fight, I’ve been privileged to join the Lions Den Scottsdale training camp. Couple big names training there and I’m loving the workout I get there with these guys. Lions den has great coaching and a terrific atmosphere to train at. I just saw an old coach Drew Ficket win the Shine Fights Grand Prix tournament. Congratulations Drew “The Master” or I think he has revamped his career and now goes by the “Knight Rider.” I’ll try to post some new pictures…I still have tons of fan pictures from previous travels to NM and Texas that need to go up. Thanks again, keep in touch, and keep stunning like me. Event took place in Dallas, Texas, June 19th. Texas Fans, thanks for making Spencer vs Ortiz memorable! Rock’in the Sponsors on the Fight Shorts! Check out this fight videos! SWC will be steaming my official weigh ins at 11:00 AM MST on Friday June 18th, 2010. They will also be streamin the fight at 6:00 PM MST on Saturday June 19th, 2010. I will be fighting Sean “Black Magic” Spencer 7-1. A couple fight opportunities coming this summer. Keep you tuned in. Couple rumors but not contracted yet..I may have a fight with 5-0 Chaun Sims of Colorado here in Greg Jackson’s show. I would love to bang with Chaun. Exactly the kind of BJJ guy I need before taking on Black Belt Giva Santana or Felipe Foglin, also rumored to fight in the future. The Sims fight would go on early June. Also trying to close a fight against Cole Ackerman of Montana. Hes 4-0, but has had a great Amateur record to. It be good to fight another wrestler with similar skills. Can’t wait. Lets keep our fingers crossed to see if I get these. This would be late June. Hi Guys! I’m still training my hardest, and everyday is a wonderful day to be alive. I keep hearing the economy is picking up, but nobody I know has gotten their jobs back. I know I haven’t fought in a short few months, but that’s out of my control. Really its up to promoters and their matchmakers. If it was up to me, I would fight every weekend, maybe even twice a weekend if possible. If you visit my site regularly, you’ll know I was supposed to fight last month, but my opponent pulled out. I have a couple verbal offers to fight in June, so I will get with my management keep training hard like I always do. I had a couple training sessions with UFC Vet Drew Fickett. He’s training hard and getting ready for his long awaited jump start on his fight career. I wish him well. Anyway his gym is called Master MMA located on the roughest side of town in Tucson..the south-side. I have a couple other “exclusive” workout spots, but you’ll see clues on on that from Youtube. Thanks again for choosing me as your favorite fighter and don’t forget to shake my hand and say “What up Stunna” when you see me. Lates. I would like to fight immediately, once every weekend if I could. Currently I have a couple verbal offers for June and July, but I need something for April and May. I may be fighting in Mexico if nothing comes up. Please contact my manager at the link on the bottom of the page. Alan Shook crys injury 1 week before Fight with Ortiz! Disappointing. These guys should really research me before signing a contract with a killer. I left all my videos online for him and gave him all the opportunity to learn my game. He couldn’t of course, because my style is explosive. While only 1 week away from my fight in California and Alan Shook pulls out. Keep Watching my Videos ALAN SHOOK Because I’m Coming for you on March 26th! The Stunna’s going huntin’ and Moose is in Season! The Stunner’s Take down Wizardry! This is about all my take-downs from half my fights. I’ll post a new video when I get them all! This just reminds you that you can’t beat me in the clinch or on the ground. Even you BJJ guys. You’re going to have to kill me to stop my reign. Going into their November fight, you knew that North Texas’ Will Florentino and Arizona’s Jacob Ortiz had the potential to be an awesome battle. However, when these two fighters stepped into the cage at SWC 9, an explosion of atomic fury would be produced that would trump any other fight both locally and, I dare say, nationally. It was a war, you hear me, a war that was both brutal and beautiful in nature. It was the type of fight that contained all the ebb and flow of a classic Rocky movie coupled with the excitement paramount to an MMA bout. In the end, Ortiz pulled out a bloody hard-fought decision, but truthfully, the real winners on that night were the fans lucky enough to be in attendance who rewarded both fighters with a standing ovation. TRULY A NIGHT OF GREAT FIGHTS! The year is almost over and the SWC put on their final event for 2009. This show was by far the best of the year for the guys at the SWC. The matchups were put together well and made the night exiting to watch. It was a great turn out at the show and the fans got their monies worth of action from the fighters. Our impression is that the SWC is growing out of the problems of the past and proving that they are here to stay. The evening had several memorable battles, some of which got pretty bloody. Unanimously everybody we have talked to agreed that Jacob Ortiz vs. Will Florentino was fight of the night. These guys went 5 rounds to the bitter end. Both fighters were clearly exhausted and left it in the hands of the judges. A tough fight to call, it could have been given to either fighter and everyone would have been OK with that. Jacob Ortiz took the victory by split decision and surely won several new fans in Texas. Just noticed my Ground and Pound was highlight on this poster! Watch my interview and fight Video where I force EliteXC and Belator Veteran out of our last fight via ground and pound 2nd round on September 18, 2009. Jon holds two Texas MMA Promotional Belts. He came in with a Pro Record of 15-6. Watch the most exciting fighter in the world! Does anyone know Craig Piligian, Andrea Richter, or Brian Diamond? Craig, Andrea, and Brian….I got something for you…Something you haven’t seen for a while. Please contact me. KOBE WINS BIG IN TEXAS! I won in Texas against Will “FURIOUS” Florentino now 6-1 of Flordia. Supreme Warrior Championship held its ninth event Saturday at the Frisco Convention Center. With eight previous events for me to compare it to, SWC 9 was by far the best event that SWC has ever assembled. SWC 7 showcased the best fight card that I’ve seen on the local level. SWC 9 had a solid card, along with excellent production value, and a packed house. As a bonus, the dreaded 20-minute intermission was eliminated, enhancing the non-stop fight action. With all that said, the fights were entertaining and showcased a wide variety of MMA styles, with Ortiz vs. Florentino getting my vote for Fight of the Night honors. Keep checking back on information about SWC 10, which will probably take place in Jan of 2010. 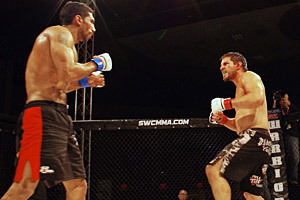 Frank Barrigan defeats Frank Ortega, main event. The one-sided fight was stopped at the end of the second round because of an injury sustained by Ortega. A large hematoma on Ortega’s left cheek prevented him from returning for a third and final round. Johnny Bedford defeats Tim Snyder, rear-naked choke, 55 second mark of first round. Although this was a bantamweight fight, Bedford retains his SWC featherweight title. Clint Godfrey defeats Rocky Long, decision. Outside of the first minute of Round 1, in which Long was effectively landing strikes, Godfrey won this fight in all five rounds with a smart game plan against a highly decorated Texas boxing standout in Rocky Long. Godfrey used leg strikes throughout to keep Long’s deadly hands away. In doing so, Godfrey was able to keep Long off balance, and he managed to punish him on the ground and in the standup throughout the fight. Josh Clopton defeats Mike Baskis, split decision. A close fight, most likely decided by Clopton’s effective and timely takedowns. In at least two rounds where the standup battle was pretty even, Clopton was able to land takedowns with only seconds in the round and probably took those rounds. Great strategy on Clopton’s part. I’m sure his corner man, UFC stand out Matt Wiman, had something to do with it. Jacob “Kobe” Ortiz defeated Will Florentino by split decision. Jacob ‘Kobe’ Ortiz defeats Will Florentino, split decision. This bout gets my vote for Fight of the Night honors. You could probably throw every battle analogy at this fight and it would fit. Both fighters certainly left everything in the cage at the end of this five-round battle. Ortiz did the bulk of his damage in the first two rounds. Florentino, came back and probably took both Rounds 3 and 4. With Florentino having nothing left in the tank, Ortiz took over the final round and won. It was certainly a fan-friendly fight. Daniel Pineda defeats Douglas Frey via submission, 1:55 mark of second round. Pineda was able to control the pace of this fight with timely takedowns and efficient ground and pound, with a few submission attempts sprinkled in for good measure. Hector Daza defeats Mike Sierra, first-round TKO. I was very impressed with Daza’s solid and well-rounded mixed martial arts game. He dominated this fight that lasted only one round. Daza has powerful hands, and it showed. Sierra barely got out of the first round and was unable to return for the second round bell. I’d be shocked if we didn’t see Daza on the national MMA scene soon. Jason Sampson defeats Nate Garza, first round rear-naked choke. Sampson is another up-and-comer that I can see making it into the WEC ranks sooner rather than later. Sampson was able to run through Garza with his high-level wrestling skills. I don’t even think Sampson took a punch in this rout, which ended with a tight choke around the neck of Garza. Brandon Smith defeats Jason Fisher, TKO at the 1:55 mark of first round. The hometown (Frisco) favorite Smith gets the win and pumps up the crowd. Rodney McFarland defeats Nic Smith, keylock submission with one second left in second round. These two heavyweights kicked off the event with an entertaining fight. Although McFarland and Smith are pretty large guys, there were a surprising number of ground transitions in the bout. In what I considered the turning point in the fight and probably a mistake on Smith’s part, he gave up a dominant mount position in order to attempt an armbar. In doing so, McFarland took top position and the momentum of the fight thereafter. In the end, McFarland used his size to pin Smith to the ground as he secured the keylock, obtaining the tap. I have had the opportunity to attend a number of SWC shows in my travels as a combative sports writer/blogger and if I had to sum up their shows, the word I would use would be inconsistent. Don’t get it twisted; this is not necessarily a bad thing. You see, a Supreme Warrior Championship card can break two ways: it can be incredibly awesome, or it turns into amateur hour. That’s it, there’s no middle ground. But in their defense, the last couple of SWC shows have been good, I mean really good. Obviously, a lot of the maddening aspects of their first couple of shows (seating issues, poor production, piss-poor turnouts) were a matter of growing pains. If promoting a live MMA show was easy, don’t you think more people would do it? With that being said, SWC seems to have gotten their train back on the right tracks and have made a conscious effort to give fans great action-packed fights, with legitimate local talent. This past Saturday nights card – SWC 9: Redemption – was more than aptly names as Davis Sylvester III and company, sought, and received redemption, giving fans a memorable night of action. If you missed the action, you can read the write-up here. SWC 9 showed what happens when fight fans come out and support the sport, you get a raucous crowd that creates great energy, energy that the fighters in the cage feed off of. It was a great night of fights; let’s just hope that this will be the norm going forward for SWC. The Eric Dampier Award for Biggest Disappointment– To Dallas’s Marcus Hicks who had to withdrawal from his fight as the main event of the night. Hicks is an all-action fighter who entertained fans as a former contender with the WEC before the promotional outfit passed on renewing his contract. Hicks scheduled fight on SWC 9 would have given fight fans an opportunity to see one of North Texas most visible fighters in action. Hicks did address the crowd and assured them that he would fight on SWC 10, taking place this January. The Mauro Ranallo Goofy-Yet-Entertaining Announcing Award– To the group of people seated in the VIP section directly behind press row who provided an endless stream of humorous commentary on the nights fights. There is a fine line between lively and obnoxious and these people knew how to enjoy themselves at a fight. I have to admit that they had most of us in press row chuckling to ourselves. The Britney Spears-Kevin Federline Award for Odd Pairing– To the Frisco Convention Center. SWC 9 took place at the same time as some formal Indian social gathering. It was just an odd sight to see Affliction and TapouT clad MMA junkies intertwined with Indians clad in regal traditional attire. You just had to be there. Fight of the Night – Jacob Ortiz vs. Will Florentino– You want action? You want blood, sweat, and guts? Then you would have loved the Ortiz-Florentino battle. To put it simply, this fight was a war. Both fighters gave it their all, trading shots, submission attempts, and blood as the crowd roared in giddy appreciation. It was the type of fight that humbles you when you see it. These two warriors, fighting a war of attrition, battling hard to the final bell. The only bad part was that there had to be a loser. Submission of the Night– To SWC featherweight champion Johnny Bedford who managed to choke out Renegade champion Tim Snyder in less than a minute with a rear naked choke that looked so effortless it was almost hard to believe. KO of the Night– To Frisco’s Brandon Smith who gave his hometown fans reason to cheer with his first round TKO due to strikes victory over Jason Fisher. Beleive me when I tell you that last Saturday’s fight between Jacob Ortiz and Will Florentino at SWC 9 will go down as the Fight of the Year here in North Texas. It was just that damn good. Ortiz and Florentino displayed all the traits that we as fight fans demand from our fighters. I mean, when was the last time you attended a fight that drew a standing ovation from the crowd? This fight had the makings on an all-time classic, one that those in attendace will keep in memory for life. Supreme Warrior Championship’s Davis Sylvester III has gone on record saying that he would like Ortiz and Florentino to engage in a rematch in the near future, after some well deserved rest. The plan would be for them to fight in seperate bouts with the hope that they would meet for the SWC middleweight title. And I’m not the only one preaching the awesomeness of the fight. TXMMA.com has a thread devoted soley to the fight. You can check it out here. Fights like Ortiz-Florentino are why MMA is surging in popularity. The Supreme Warrior Championship was at peak performance Saturday the 28th. They started quicker and other than the display screens being in black and white they had no technical difficulties. What they did have was a night of non stop MMA action. The fights were once again well matched, and kept you guessing the outcome. Jason Sampson took on Nate Garza, and it was clear from the beginning that Sampson was a ball musclebound meanness ready to blow up, giving him the victory over Garza in the first round by rear naked choke . The most exciting fight of the night was Jacob Ortiz vs. William Florentino. Ortiz won the match by decision, but despite having some serious lacerations Florentino would not give up. One of the main events was Brutal Johnny Bedford vs. Tim Snyder, ending with Bedford getting a win in the first round by rear naked choke. My only complaint was that while they did have time to let announcer Jeff Huston blow tons of hot air between bouts SWC “did not have time” to let Johnny give thanks to his wife, or family that had driven to Texas from Ohio, or his sponsors, a pretty unprofessional thing to do especially to one of their title belt holding fighters. All in all, it was a good night of action, and worth the trip north to Frisco, and we look forward to SWC 10! Kobe gets section published on last fight in Gladiator Magazine! Look for me in this issue of Gladiator Magazine! Stunna man made it on the UFC Tuff 11 tryout video! Check it out and see if you can find me. Some pics of me at the Ultimate Fighter Season 11 tryouts. I preformed perfectly but did not get selected. Never give up and when its your time, you’ll get what your heart desires.